Browsing Category " Restaurants "
Graffiti Bistro is a restaurant and café located on the ground floor of the Mercure Simatupang Hotel . Opened all day from breakfast to dinner, it serves both International and Indonesian food. It has a playful design, with an industrial theme. 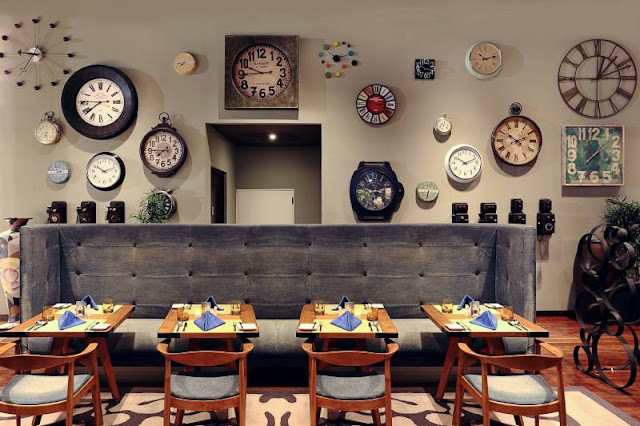 Some of the walls have giant watches and clocks attached to them, while the others are painted with colorful graffitis. There is also a collection of around 50 framed photographs. The restaurant space is quite large, with at least 80 seats and a small outdoor area. During day time, large bay windows provide ample natural lighting, making it a relaxing space for hanging out or for meeting friends. It is not sophisticated or trendy, and it is even relatively quiet, but I enjoyed it a lot for working on my laptop during long afternoons. I also had a few breakfast and dinners there when I stayed in the hotel in March 2017. Update Dec 2016: Lucy has been renovated due to noise complaints from neighbors. It is now covered by a large glass building (as in the first photo above). It looks more upmarket than before but it is still popular with the same crowd (young, trendy Jakartans). 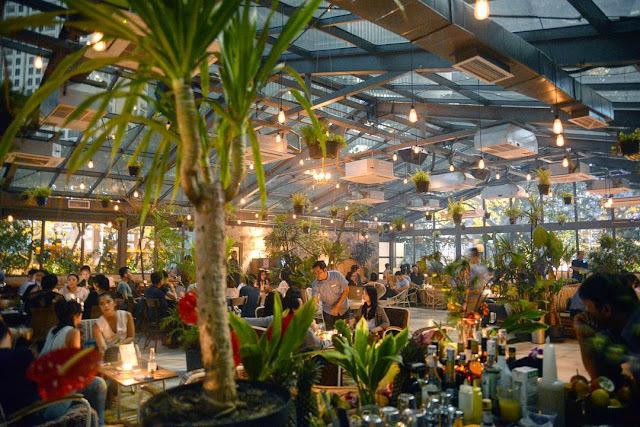 Located near Jalan Sudirman, in Fairgrounds (ex- Bengkel ), Lucy In The Sky is a rooftop restaurant/bar with an open-air garden terrace and a laid-back, close-to-nature atmosphere. It is probably partially owned by Tommy Winata, the ex owner of Bengkel and owner of the land of SCBD. The location of LITS is probably its best assets as it gives the feeling of escaping the city. Though in the heart of Jakarta's business district, it is surrounded with plants and flowers, which makes it relaxing, and a perfect spot to look at the skyscrapers around. Similar ambiance than SHY Rooftop but less expensive (80k for main dish) and with a better view. ¿Por Que No? 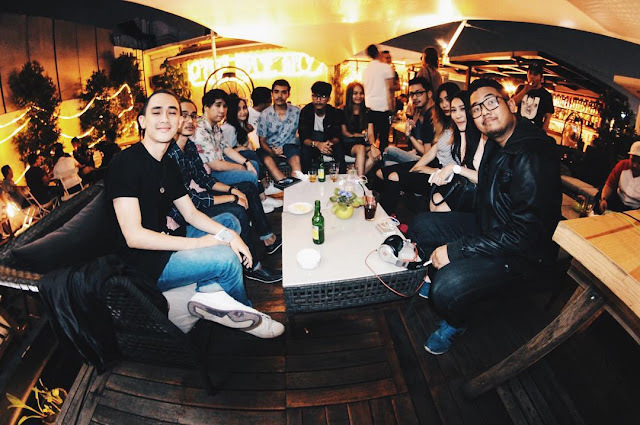 was opened in 2015 as a Spanish tapas bar and restaurant in the neighborhood of Menteng, at the northern end of Jalan Rasuna Said. While the food is decent but definitely not haute cuisine, it is an interesting venue to hangout and drink before party. Cocktails are just above Rp100,000 net and Bintang at Rp50,000 net, which is not that bad considering the central location. The food is more expensive and the portions small (obviously, small like tapas). There are 2 different areas, indoor and outdoor. Outdoor is a small rooftop where regular events are organized. 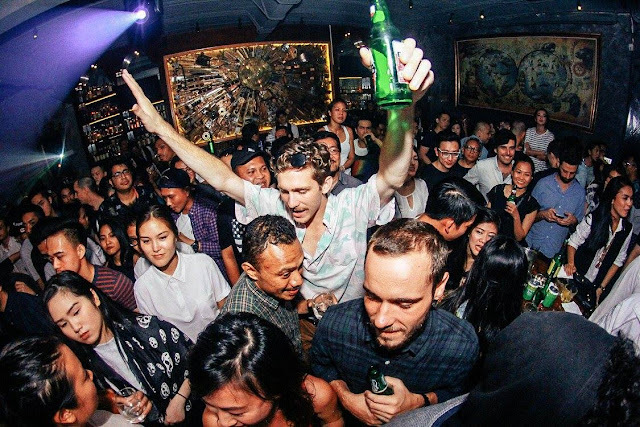 In particular, they have some techno nights that attract a young and fun crowd. You also have jazz nights, open mic nights, etc. Check their Facebook page or Instagram below to get their latest schedule. The Union Group (behind Union, Loewy, Cork&Screw, Benedict, Casa, E&O, The Dutch, Canteen, etc...) opened Caffè Milano almost 2 years ago. 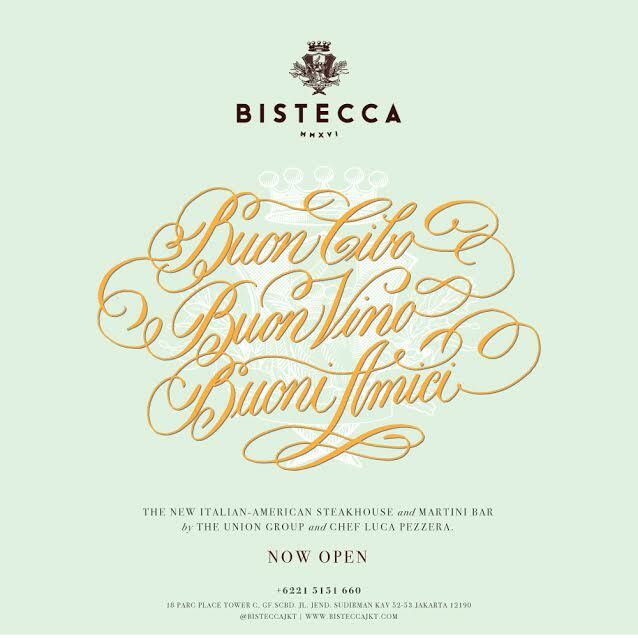 Following its success, they are opening a sister restaurant called Bistecca. This new venue is still under project and it will open in August 2016. It will be located next to The Dutch restaurant, one of the trendy spots in Jakarta nowadays. As the name suggests, the food will be mostly steaks and grilled meat, Italian-style. They will also sell fine Italian wines. The Head Chef is still Luca Pezzera. I will add information about prices, menu, opening hours, etc. when I receive them. Please comment if you know something! Update August 2016 : Bistecca is already open. Full menu available here: Drinks and Cocktails Menu Bistecca and Food Menu Bistecca . 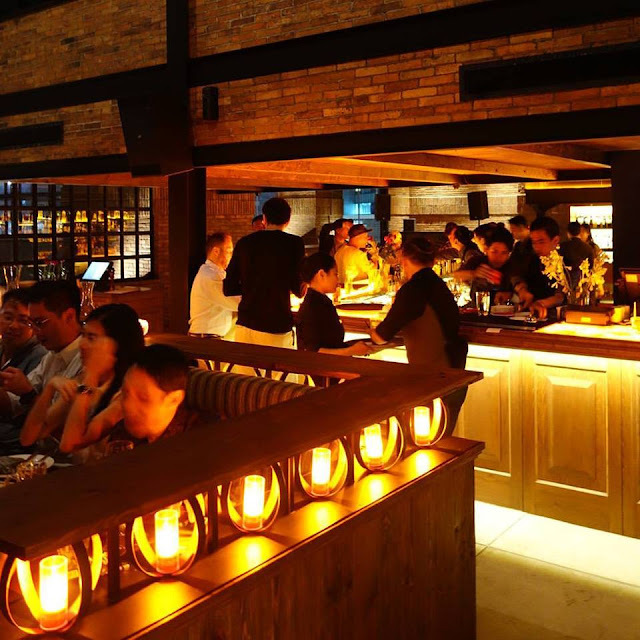 Chamber is a whisky/wine bar and restaurant squeezed between Potato Head and Cork&Screw in Pacific Place mall. It replaces Capocaccia . It is intimate and comfortable, with an outdoor and an indoor area. 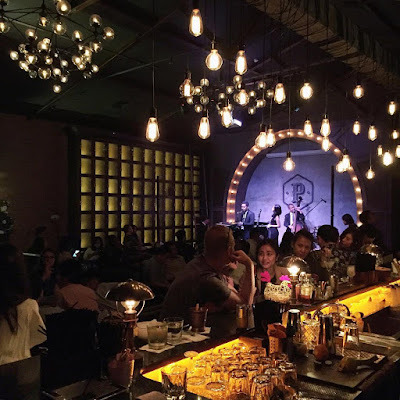 The design follows the current 1930s vintage trend that you can see in several speakeasy bars in Jakarta . It is a bit over the top for my taste. They target rich Indonesians by advertising a large collection of wines and spirits. Most items can only be ordered by bottle so avoid if you come alone. This is a really late post. 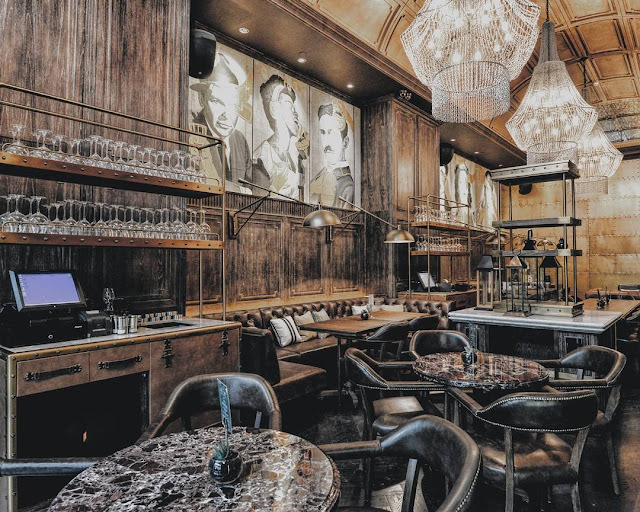 I had visited Branché a few days after it had opened a couple years ago (2014) and I had never published my draft review until now. At the time of my visit, I had met with the owner, a nice, young guy who seemed surprised by the sudden success of his bar. Even though Branché is simple compared to nearby trendy venues in Senopati, it is still quite popular with Indonesians. 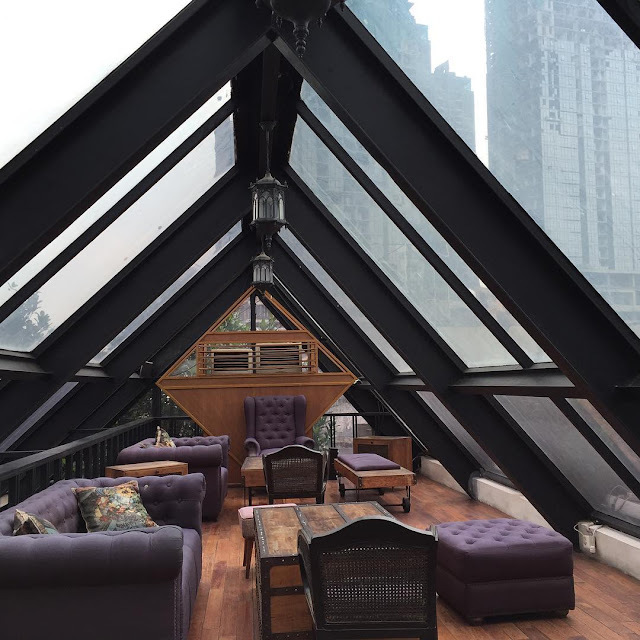 Kila Kila is a brand new rooftop restaurant serving fine dining Indonesian cuisine. It is located not far from Pacific Place Mall and offers a beautiful view over SCBD. It is managed by Akasya Catering, a famous company owned by Enny Latief. They provided the food for numerous VIP events such as the wedding of Edhie Baskoro, the son of SBY. If their food is good enough for the president of Indonesia, it should be good enough for you too. Gonzo's is a brand-new restaurant serving Mexican, Texan and Tex-Mex specialties. Its first location is in Lotte Mall Kuningan, slightly hidden behind Ranch Market. It doubles up as the first Margarita bar in Jakarta. The theme is Mexican but I don't think it was the objective of the owners to recreate Mexico in Jakarta. It is colorful and friendly, yet simple. Gonzo's caters to a mall crowd who needs a fun place for meeting/hanging out. They serve mostly popular dishes like Burritos, Fajitas, Steaks, Tacos, Quesadillas, etc, not fine dining Mexican food (see Full Menu ). Ya Udah Bistro and Die Stube have a new competitor. 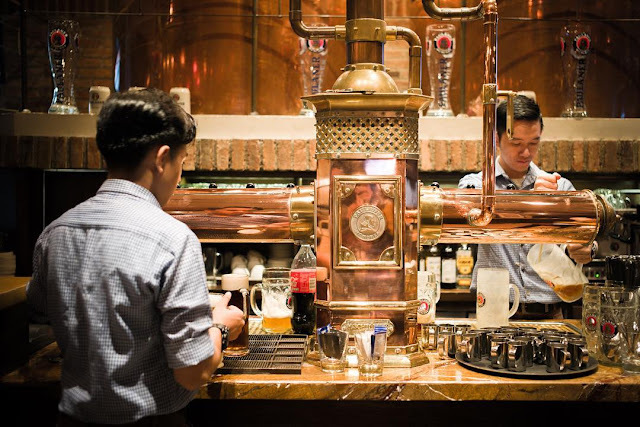 Paulaner Brauhaus is the most upmarket German restaurant and Brasserie in Jakarta and it is part of the luxury Kempinski hotel. It is in a central location within the Grand Indonesia mall, just next to Social House. It is almost always busy, any day for both lunch and dinner. The crowd is a mix of expats, business travelers and Indo-Chinese customers who seem to enjoy the non-halal pork specialties. They serve a complete menu that includes any kind of sausages you can think of. One of their most popular dishes is actually a huge sausage platter that costs Rp140,000. 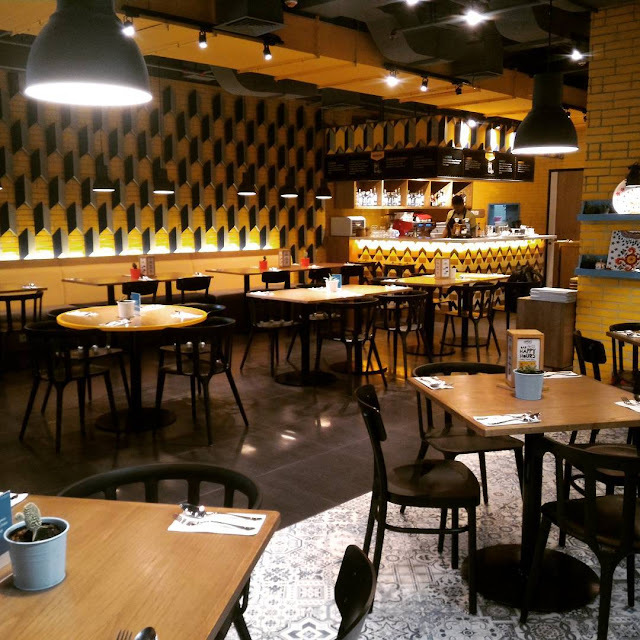 Blue Fox is a cool joint located in the busy Senopati. It is both a Restaurant and a Lounge. The food there is mostly Western with American, Spanih and French influence. Update 2018: Hide & Seek is now called The Swillhouse and it's a club specializing in Hip Hop/Rn'B. 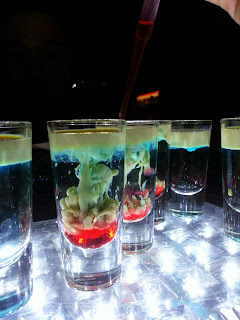 Hide & Seek is a restaurant and bar located next to Lucy in the Sky, Fable and Potato Head Garage in SCBD area. It is a small, discreet venue with an industrial theme. I think they got their inspiration from the Nautilus submarine in Jules Verne's novel. I never tried the food there, but I went quite a few times for parties on Friday and Saturday nights. It's not too crowded so it's perfect for having a few drinks before moving elsewhere in SCBD. Occasionally they have good DJs as well. Beware that most clients are quite young, in their early 20s. 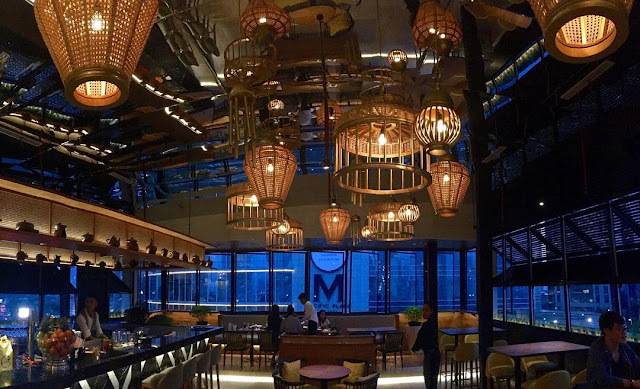 Motion Blue is a fine dining restaurant/lounge located in Fairmont Hotel in Jakarta. It was named Cotton Club for a couple months, then changed its name. You can read my review of Cotton Club here . The concept of Motion Blue is very similar. 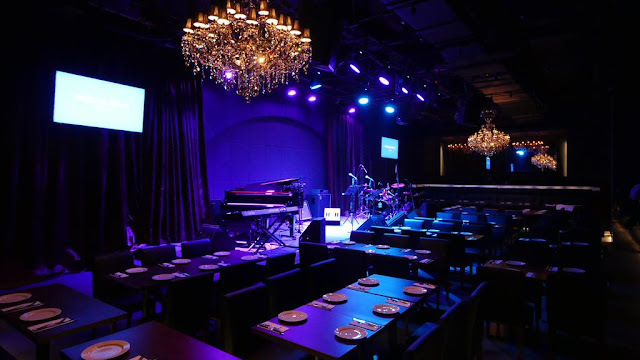 It is an upmarket venue with live jazz bands or musicians every day. It is even more expensive than Black Cat . The food is nice, with mostly French fusion dishes.